Living room, kitchen, family room all on the main level. Bedrooms are located upstairs. Deck and landscaped backyard create a peaceful and private retreat. This 3 bedroom, 2 bath home has an open living, dining and kitchen area. The slider off the dining room gives you access to a patio and large, fenced backyard. This home has been lovingly updated to create a peaceful retreat. Christmas Valley Vacation Rental Backing to Forest Land, great for hiking, exploring and cross country skiing. Very quiet location but still close to all of South Lake Tahoe's Activities. 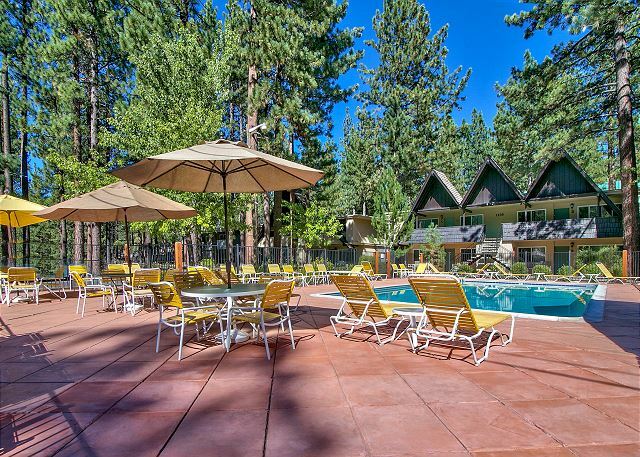 Located a few blocks off of Pioneer Trail it is only a short drive to the lake, Heavenly Ski Resort or all the dining and shopping areas at Ski Run Blvd and the Heavenly Village.